The word "monkey" describes 264 distinct species, each with unique characteristics, including size and weight. Since so many different monkeys exist, there is no single average or usual monkey weight. They can roughly be described as small, or under 15 pounds; medium, or between about 15 and 30 pounds; and large, or 30 pounds and over. The pygmy marmoset, or Callithrix pygmaea, is the smallest known monkey in the world, weighing only 4.2 ounces on average, or about a quarter of a pound. They reach about 5.3 inches long, and females are often slightly larger than males. Pygmy marmosets are New World monkeys and are found in Brazil, Ecuador, Colombia, Peru and Bolivia. The largest monkey is the mandrill, or Mandrill sphinx, which averages around 77 pounds and 3 feet tall, but a few can reach over 100 pounds. Mandrills are an Old World monkey and are found in equatorial Africa, where they make their home in rain forests. They are easily identified and well known for their brilliant facial markings, which include blue and red stripes on the skin around their noses. Old World monkeys, which include 133 species, are those found in Africa and Asia. They make up the Cercopithecidae family, and are generally medium to large in size, ranging from 3.5 to 110 pounds. Well-known Old World monkeys include the baboon, which weighs between 33 and 82 pounds; the rhesus monkey, which weighs around 17 pounds; and several species of langurs, which weigh, on average, between 20 and 30 pounds. 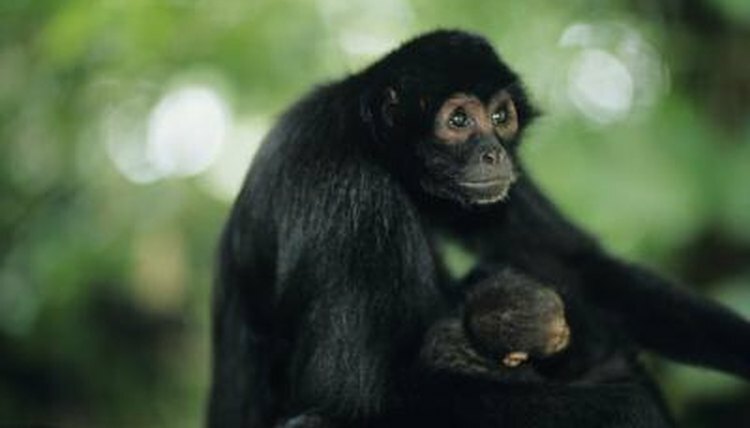 New World monkeys, or families Cebidae and Callitricidae, are found in South America, and include 53 known species. They are generally smaller than Old World monkeys, ranging between a quarter of a pound and 33 pounds. Most New World monkeys are not equipped to live on the ground, and spend the majority of their time in the rain forest canopy. Well-known New World monkeys include marmosets and tamarins, which range from a quarter of a pound to 2 pounds; the capuchin monkey, which weighs between 3 and 9 pounds; and the howler monkey, which weighs between 15 and 22 pounds. Monkey species commonly kept as pets are usually small and medium-size, ranging from a quarter of a pound for the pygmy marmoset to 35 pounds for the Celebes or Java macaques. Among the most popular pet monkeys are the vervet at 4 to 15 pounds, common and silvery marmosets at three quarters of a pound to 1 pound, the squirrel monkey at around 2 pounds, and the spider monkey at 13 to 25 pounds.